In Western arranging, we’re also focused on blooms rather than leaves and branches (though in our Basic class Jane uses plenty of branches and foliage.) 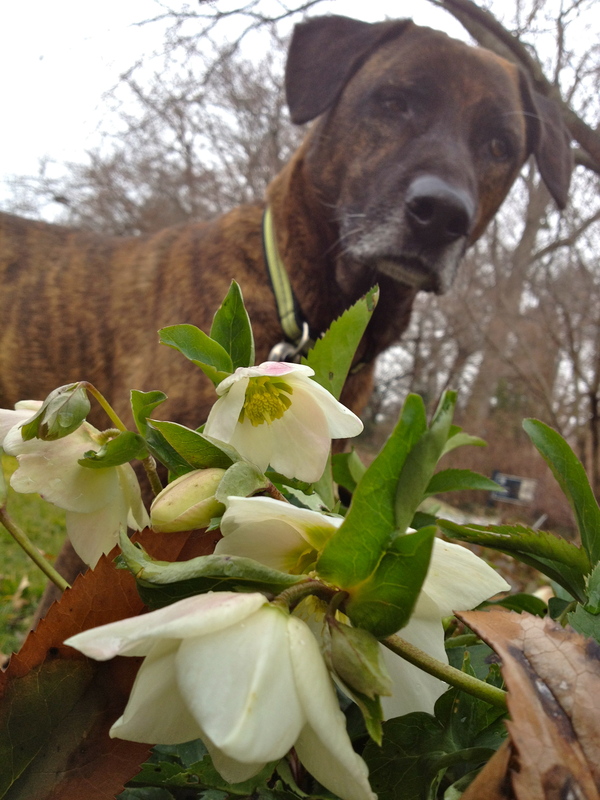 And not just blooms, but the perfection of blooms at their most perfectly open moment. 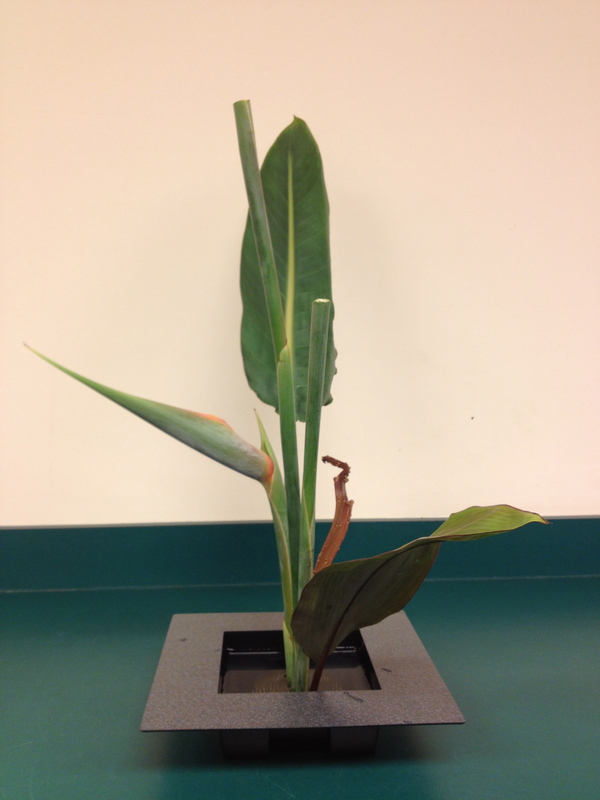 In Ikebana, imperfection is embraced. A holey leaf is holy. And the flowers are shown in different stages to represent the passage of time: a fully open flower = the past; partially open flower =present; and a bud = the future. Thus the choice in Western arranging of fully opened blossoms is considered “pitiable” in Ikebana, because these forms only represent Death. “Not a pretty thing,” says Janet. But in Ikebana, using seasonal items that are not “perfect” brings nature into the house and allows us to reflect on the concept of time. As you can see, there is a lot of symbolism, and a reverence towards nature. That’s because Ikebana’s genesis was religious, synthesizing elements of Shintoism and Buddhism. This is cool stuff: in Shintoism, the indigenous religion of Japan, nature is sacred, and contact with nature is a way of being close to the gods. The monks would offer entire plants – root and all – to the gods. This is the basis of arranging at its most primitive. In the 6th century, Buddhist monks gathered flowers and branches left after storms and arranged them at the foot of Buddha statues. And that was where Ikebana sprang from. I love these ideas because they express some of my own feelings about nature/plants. I’m not religious, but I do hold nature sacred. Gathering plant material from the outside, and putting it in a container in a design that enables me to connect with the material is an offering of sorts. To Mother Nature, as I call her. 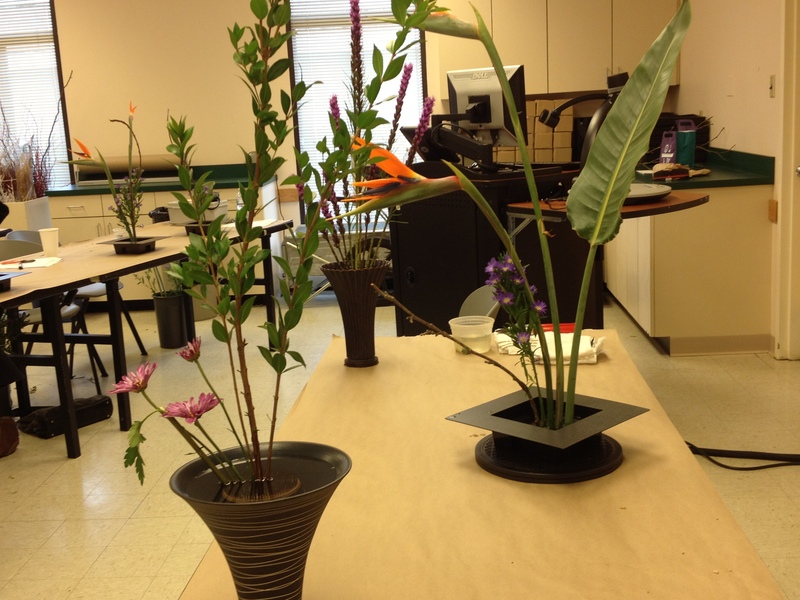 Then Ikebana took off, and evolved into many styles. These many styles include (short-hand of my notes from class not meant to be exhaustive by any means): Rikka – 10-20′ high, these designs were microcosms representing mini landscapes complete with hills rivers and towns. Chabana – 17th century, these accompanied the tea ceremony (cha = “tea”) and held one branch and small flower. Shoka – late 17th century, Shoka answered the need for something between Chabana and Rikka that could be ‘for everyone.’ These designs are asymmetrical triangles with open spaces. 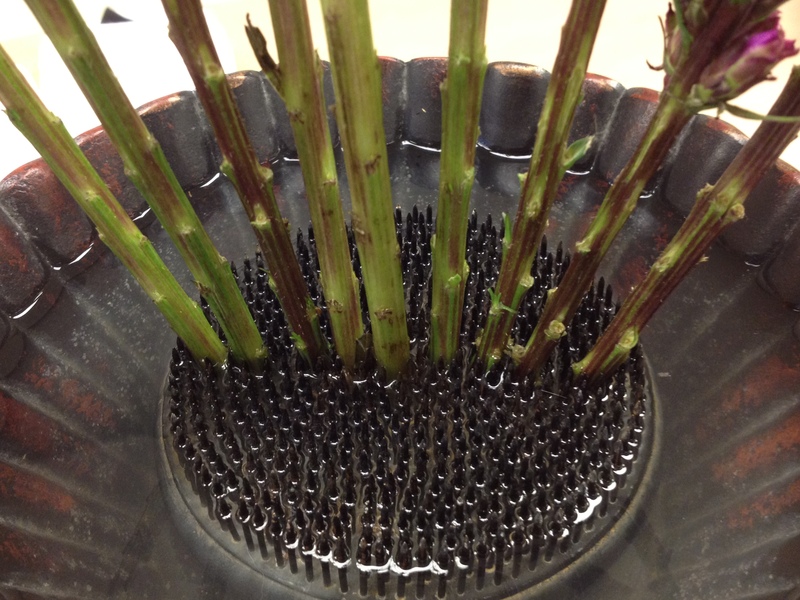 Stems are tightly bundled at base to resemble single growing plant. More on this, we made one! Nageire – chabana “on steroids.” Tall narrow container. More on this later, we made one! 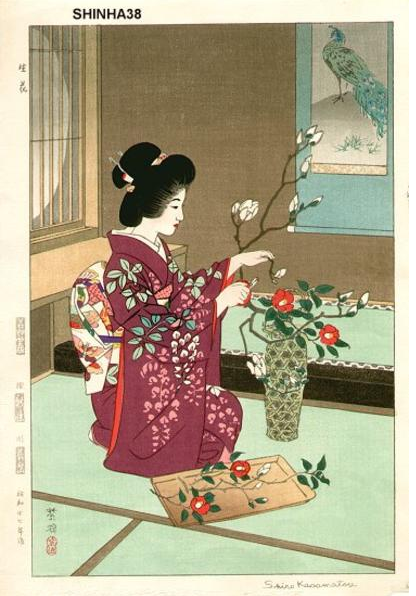 Moribana – “piled up flowers” from the late 19th century. Low rectangular container. More on this later, we made one! Free style – these designs use the same design principles as Western arranging but still represent nature. And just to make things more confusing, there are a bunch of different ‘schools’ of Ikebana that all have different rules about how to create these various styles. Janet studied at the Ikenobo school, the oldest school with the most traditional styles. 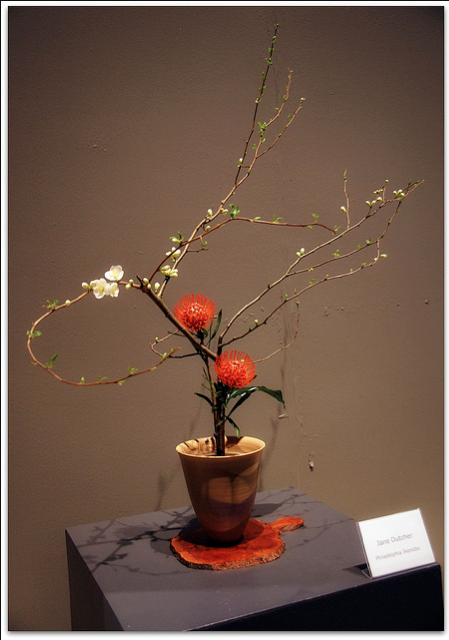 But there is no competitive spirit in Ikebana – unlike Western flower arranging where a blue ribbon won at the Flower show is the ultimate. 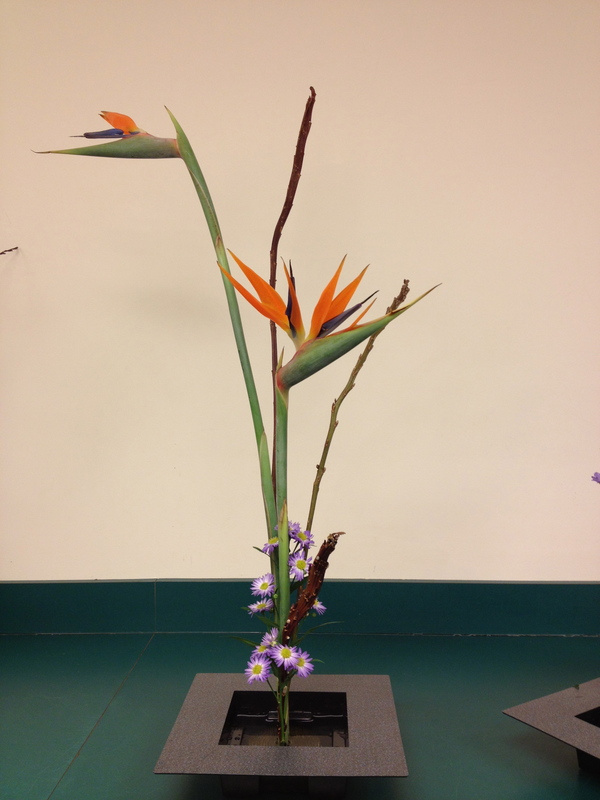 “Japanese flower arrangements are for pure enjoyment and never judged,” says the Ikebana International brochure. But honestly I do detect a tiny hint of condescension from Janet that her way is the better way of doing things, that us poor Western saps are lost in our notions of perfectly rounded radial designs when we could be communing with nature and really doing something of spiritual weight. I’m trying, okay? That’s the point of all of this floral design stuff for me, actually: to find something that fulfills me, and balances me. Where I use my head, heart and hands. So far, so good. Okay, now we are to make a Shoka Shimputai. That’s a straight line arrangement. The Shoka rules: all the stems must be placed vertically and in a straight line centered in the kenzan (the spiky frog or “sword mountain” that holds stems in place – watch out, very sharp!) and the materials must be free of leaves measured in a fist height above the container (the mizugiwa – edge of water.) Then the materials are fanned out to “let the materials breathe.” The Shoka will be viewed from the front, so if you’re using any big leaves, be sure to angle them so that they’re not too overwhelming and to create more depth. 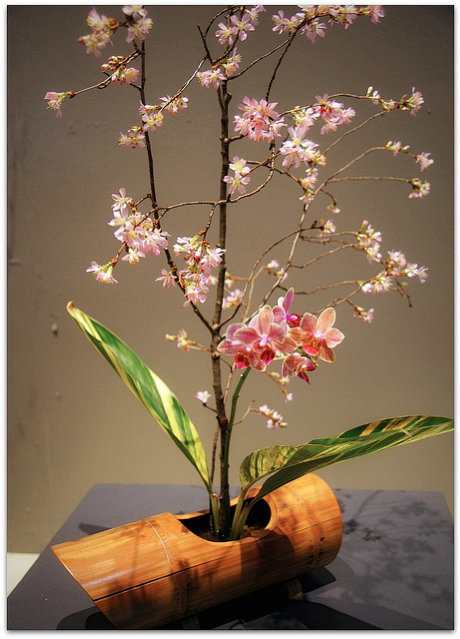 Depth is a big thing in Ikebana. 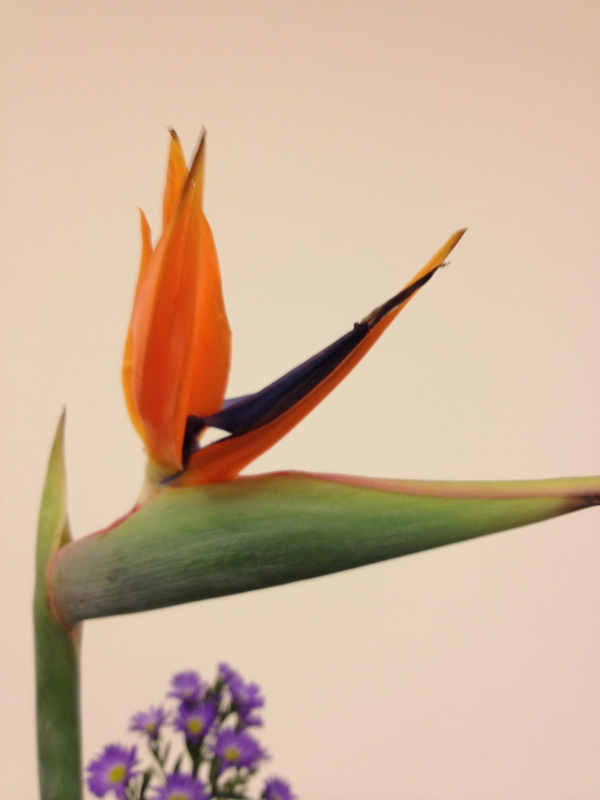 emerging bird - you can gently dig out the blooms with your thumb! Then the Yo or supporting actor, which is meant to contrast with the Shu but be subservient. This is the Willow for me. After that, the Ashirai goes in, which is the helper that fills in if seasonal materials are needed (there always must be something seasonal.) The Ashirai balances things, can supply color, and ties things together. The Aster. I found this arrangement pretty easy, but this was my first time working with a kenzan, so I had to master that. Once a big branch of willow goes in, it’s pretty hard to get out, so it’s a good idea to hold things in place where you intend to put them before sinking the stems in. 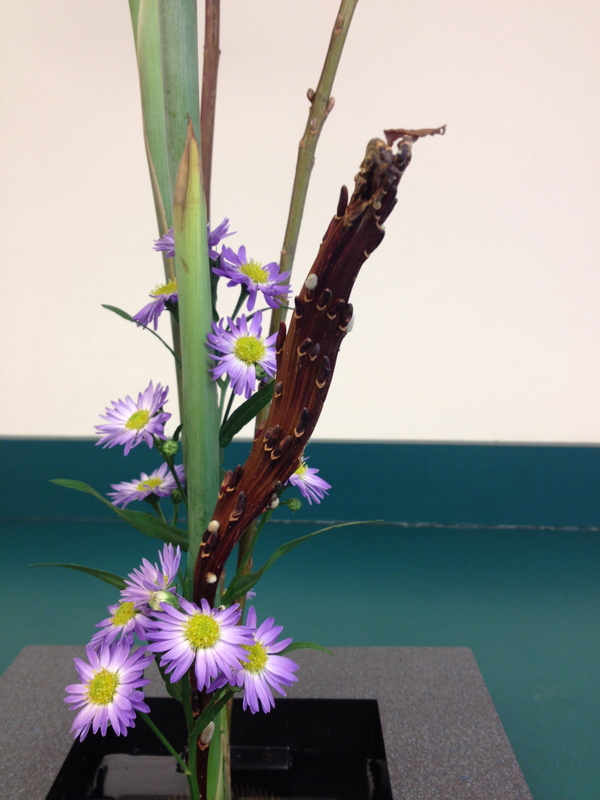 So you see how the Bird of Paradise is dominant, the willow supporting, and the aster a touch of helping color. 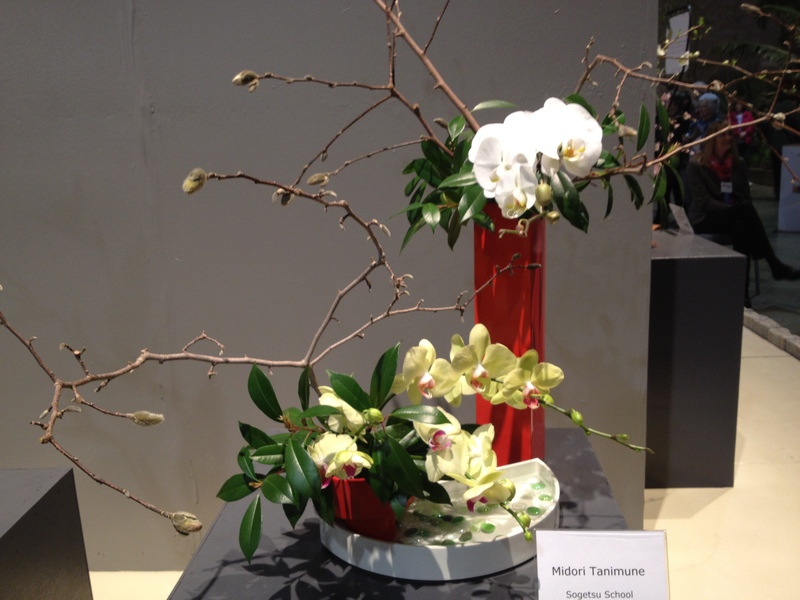 And though she has stressed the fact that Ikebana is not competitive, there is a right and wrong way of addressing the basic rules, so she goes around and modifies some of our arrangements – to get a better line, to keep the stems straighter, or more fanned out. Wrestling with the stems being straight is definitely difficult. 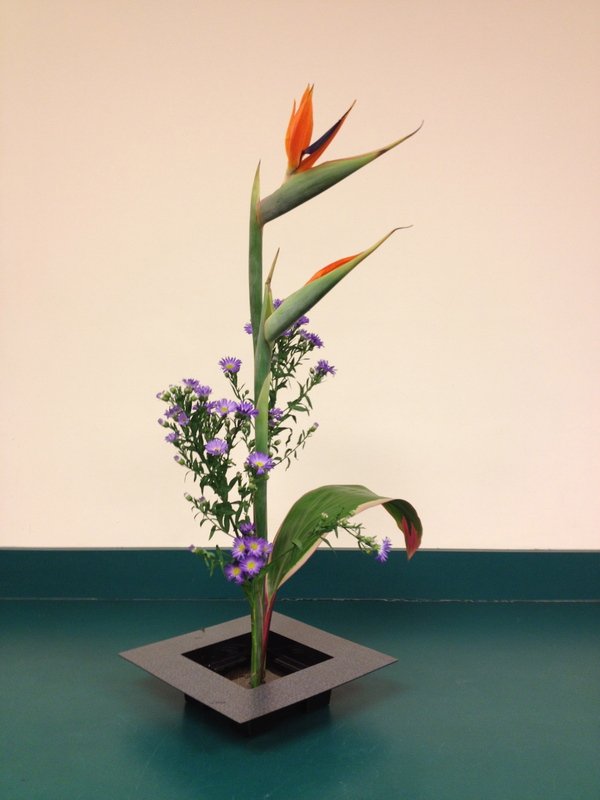 Pat's Shoka uses Bird of Paradise foliage, which still counts as the Shu. She clipped off the stems, wanting her design to be simple and clean to help offset the complexity of her life. Beautiful. All in all I really enjoyed Day 1 of this class, though I did feel like despite it being emphasized that Ikebana is supposed to be non-judgmental, the instructor was actually very judgmental towards all of our designs and was not effective at communicating her thoughts in a gentle constructive way. 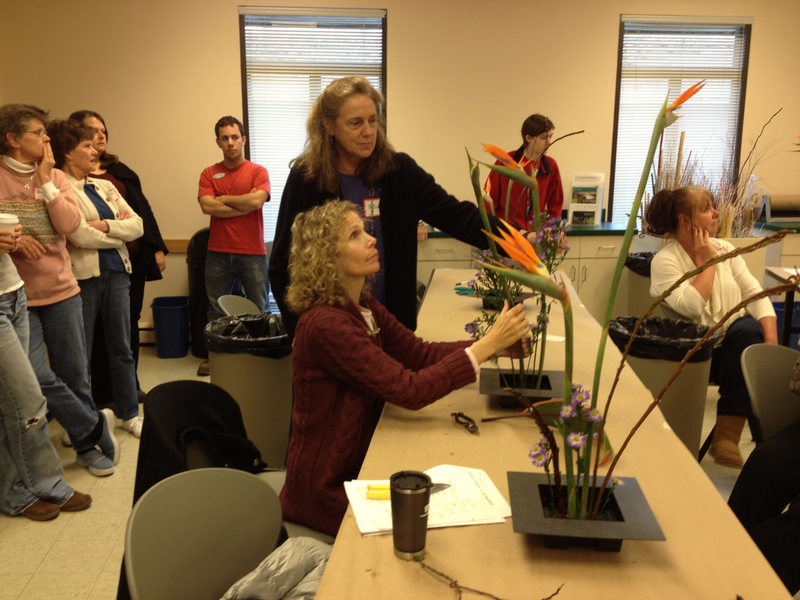 Day 2 was different in this regard…so stay tuned, there’s more Ikebana to come!